What God has brought together, the adversary wants to see destroyed. Are you prepared for the fight? 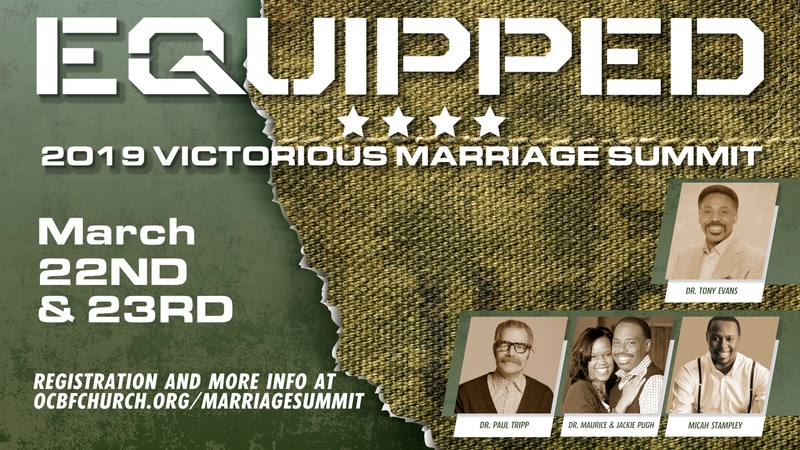 Get Equipped to develop a battle plan for your marriage at this year’s Victorious Marriage Summit featuring 4-star generals, well versed in the art of marriage including our own Dr. Tony Evans, Dr. Paul Tripp, and Dr. Maurice & Jackie Pugh. Also falling into the formation is Stellar-Award winner, Micah Stampley, as our musical guest. ONLINE REGISTRATION IS CLOSED. ONSITE REGISTRATION IS AVAILABLE AT $40/COUPLE. HOWEVER, LUNCH ON SATURDAY WILL NOT BE INCLUDED. FOOD TRUCKS WILL HAVE LUNCH FOR SALE. CHILDREN’S MINISTRY IS NO LONGER AVAILABLE. UNREGISTERED CHILDREN WILL BE TURNED AWAY.